I know. I can’t believe I ‘went there’ either. I remember the first time my Irishman told me about ‘meatzza’, my first reaction was ‘gross’. Definitely not. If I still haven’t convinced you, instead of calling it ‘meatzza’, you could just think of it as a very large flat meatloaf. And serve the slices with lots of salad or veg. Like I do! There are 7-ingredients in the list here, but one is salt which I don’t count in my ‘6’. 1. Preheat your oven to 250C (480F). Line a baking tray with baking paper. 2. Bring a small pot of salted water about 2cm (1in) deep to the boil. Add broccoli and simmer, covered for 5 minutes. Drain. 3. In a medium bowl, mix beef, almond meal, eggs and salt. I find hands are best for this. Transfer the meat mixture to your prepared tray and use your hands to flatten it out into a circle about 30cm (12in) diameter. I like to make a little border that is slightly thicker around the edges. 4. 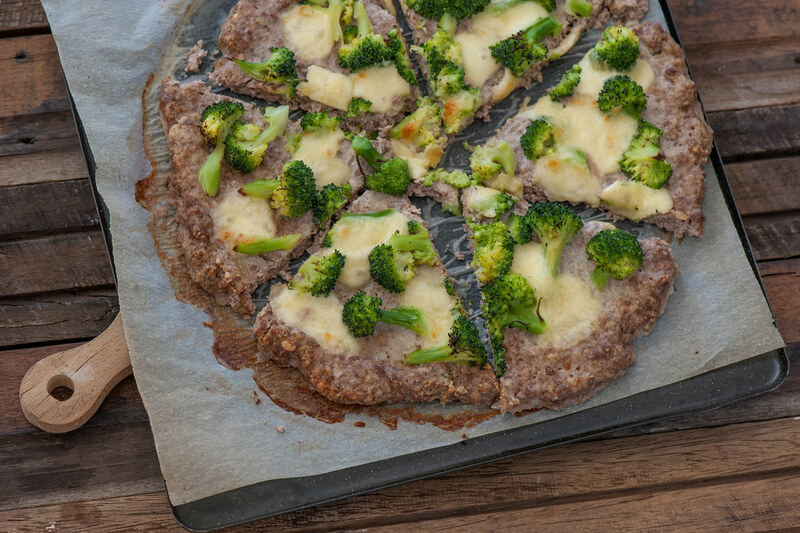 Top meatzza base with broccoli. Tear cheese and scatter over. 5. Bake for 10-12 minutes or until cheese is melted and the meat is cooked through. If there’s a little liquid seeping out, just pat it dry with paper towel. 6. Serve sliced into wedges with basil / spinach leaves on top. 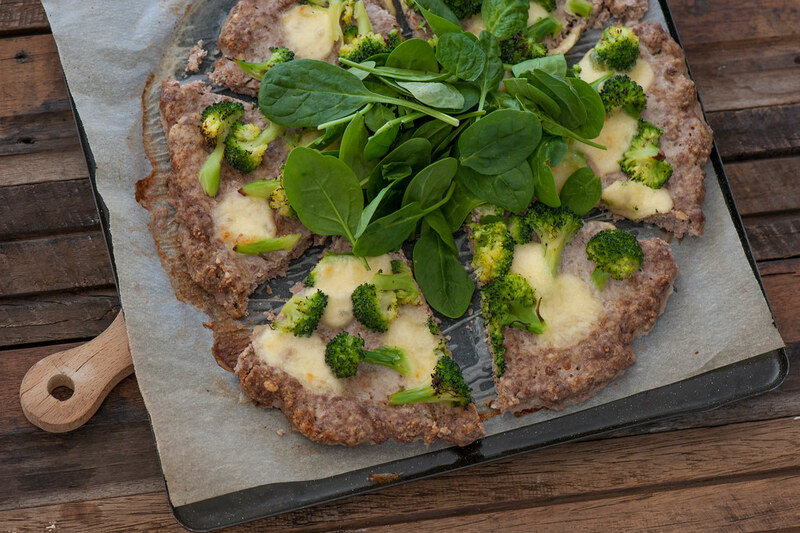 vegetarian – Try my cauliflower pizza with the broccoli + basil toppings. more substantial (carb lovers) – serve with garlic bread. Or use regular pizza bases. more substantial (low carb) – use the recipe to serve 2. Or serve with a substantial low carb salad or veg side. margarita – replace broccoli with your favourite pizza tomato sauce. cheesier – serve with lashings of grated parmesan. different meat – replace beef with ground chicken or turkey. egg-free – replace egg with 2 tablespoons olive oil and 50g (2oz) grated parmesan. nut-free – replace almond meal with fresh bread crumbs or half breadcrumbs and half grated parmesan. Or use ground sunflower seeds. hot! – wonderful with your fave hot sauce or a drizzle of chilli oil. pizza ‘rosso’ – add some tomato passata or crushed canned tomatoes before topping with the broccoli. minced (ground) beef – freeze it. almond meal / fine salt – keep them in the pantry. bocconcini or mozzarella – freeze them.